It's now possible for you to spread the word to all your friends about the next Apex Challenge event, taking place next month. Posters and flyers advertising the April 2009 Overnight Challenge have just been placed online. Demand for places at this year's event looks to be much higher than in previous years after the event was brought forward out of the school exam season. There's already been interest from well over the 30 teams and we want to make sure as many as possible can take part. The new poster is a great design and ideal for printing out and putting up wherever your Scout group meets to draw attention to it. The electronic flyer is also there for you to save to your computer and email around to people you think might want to take part. Whichever you use, make sure you spread the word about the next event and enter online now before places run out. Download a poster to print off and display where your Scout group meets or to send out to people who you think might be interested in coming to either of events this year. 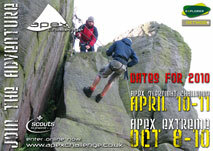 It has the dates for both the Apex Overnight Challenge in April and the Apex Extreme in October. (Note this is a *.pdf file and is A4 in format).